Happy National Sausage Pizza Day! Today is one of my favorite days of the year. Can you believe there’s actually a day to celebrate my favorite pizza? I mean, honestly, who doesn’t like sausage, mushrooms, and black olives? I’m also a taco pizza kinda girl. 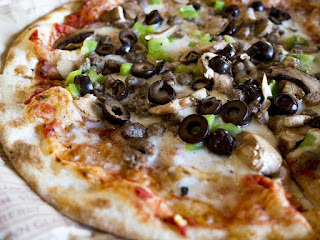 For my fellow pizza connoisseurs, if you’re ever in the Laguna area, check out Gina’s Pizza. They have the best pizza I’ve ever eaten. Fresh ingredients, super gooey cheese, and homemade sauce. Delicious! If you like your pizza loaded, definitely try The Godfather: Pepperoni, Italian sausage, crisp bacon, meatballs, pastrami, roasted garlic, and mozzarella. 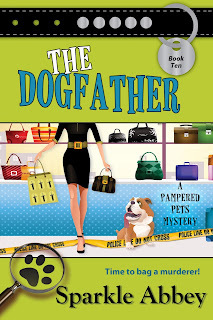 Oh, and in case you haven’t heard, The Dogfather, book 10 in the Pampered Pets Mystery series, is now available. I have never had pastrami on a pizza! I will need to try it! Now I want pizza! Have to remember Gino's next time I'm in Laguna. We love pizza made at home. I make a homemade crust and we live everything from a junker with lots of meats and veggies to the hog heaven pizza which combines mozzarella and cheddar cheeses and topping with Canadian bacon, crumbled cooked bacon and chopping onions. Can't wait for the opportunity to read "The Dogfather"!